Nose: Honey, baked apricots, nutmeg, red apples, cinnamon sugar, coconut milk, bees wax, vanilla, soggy Weet-Bix covered in brown sugar. A slight grassy tinge just wafting lazily in the background. Palate: Honey, grapes, sultanas, and more of that soggy and sugary Weet-Bix. Some apples are also present somewhere in the background – this time green rather than the red apples on the nose. A tiny amount of cinnamon – proper cinnamon, not cinnamon sugar. Quite sweet, but not overdone. Mouthfeel: Thicker than any other Teeling whiskey that I’ve tried – resonably weighty for an Irish whiskey, medium weight when compared to a lot of Scotches. A slight tingle on the tip of the tongue that I’ve come to expect from Teeling whiskies – no burn, just a little warmth (although not as much as either the Teeling Small Batch or Teeling Single Malt). Chewy and dry – no oils at all. Extremely smooth. Finish: Medium length – much longer than either the Teeling Small Batch or Single Malt. Quite sweet – finger buns dusted with cinnamon. A bit buttery. The warmth hangs around quite pleasantly. On the rocks: A big boost to some grassy notes on the nose – still lots of honey, nutmeg, and cinnamon sugar; a lot less fruit though. Ice doesn’t really change the palate much – gives a bit more heft to the cinnamon, but that’s about all. Thickens the mouthfeel up, makes it creamy, and even more chewy than before. Ice kills the finish a bit – it extends it, but really dampens the flavours, leaving mostly cinnamon; and annihilating the warmth. Sweet heavens above – this whisky is amazing! 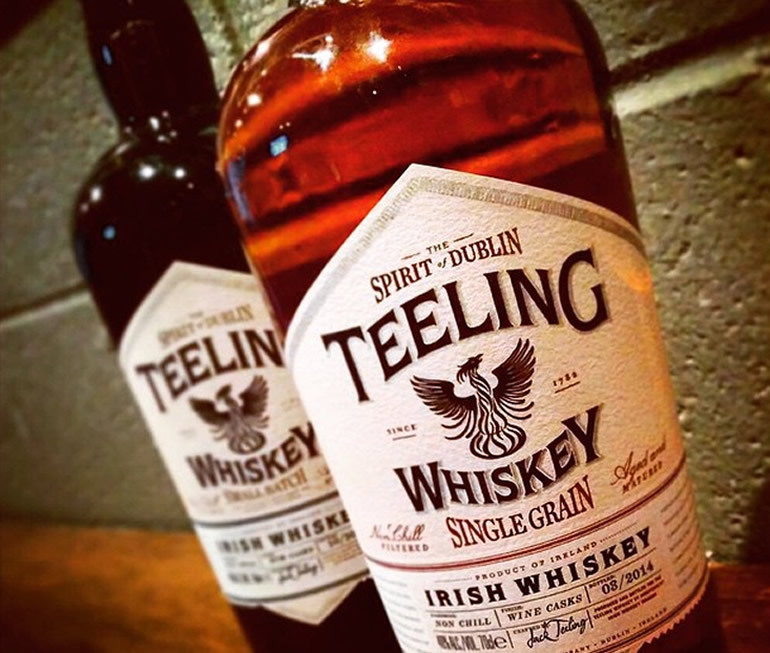 This single grain costs somewhere between both of its siblings, the Teeling Small Batch, and the Teeling Single Malt – which is itself great value, but is worth every single extra cent. I haven’t had many single grain whiskies – and none that have left a strong memorable impression; but after this one I may just have to investigate the whole category further to see if anyone else can stand up with this Teeling. The whiskey seems quite young and punchy, full of fruits and lively flavours, but is also incredibly smooth and balanced – so extremely drinkable. Non-chill filtered, bottled at 46%, distilled from 95% corn and 5% unmalted barley at the Cooley distillery and then aged in ex-California Cabernet Sauvignon casks – apparently for a touch under 6 years, although no age is specified. Thoroughly moreish. The distillate is made from the same recipe as Beam/Cooley’s Greenore Single Grain, but where the Greenore is matured soley in ex-Bourbon casks, this Teeling Single Grain has been matured entirely in Cab Sauv casks that were chosen by the Teeling brothers. The Teeling distillery in Dublin has started outputting new make spirit, which will undoubtedly end up being bottles instead of the current spirit that has been purchased from the Cooley distillery – which was formerly owned by the Teeling family – when it is old enough. This really is a smashing whiskey, and one that I would probably purchase even at a fair premium on its current price – it’s great value, and will undoubtedly find a constant place in my whiskey collection. Best drunk neat – ice and water really dull the lively punch that give this whiskey its character. One of the best noses of any whiskey that I’ve tried so far, good mouthfeel, and a delicious palate.